Once per turn: You can target 1 Level 4 or lower Zombie-Type monster in your opponent's Graveyard, that was destroyed by battle; Special Summon that target to your side of the field. 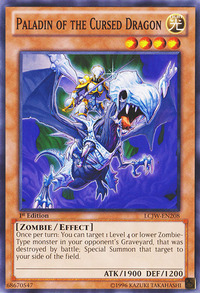 This card is a Zombie-Type counterpart of Paladin of White Dragon , Paladin of Photon Dragon and Paladin of Dark Dragon. 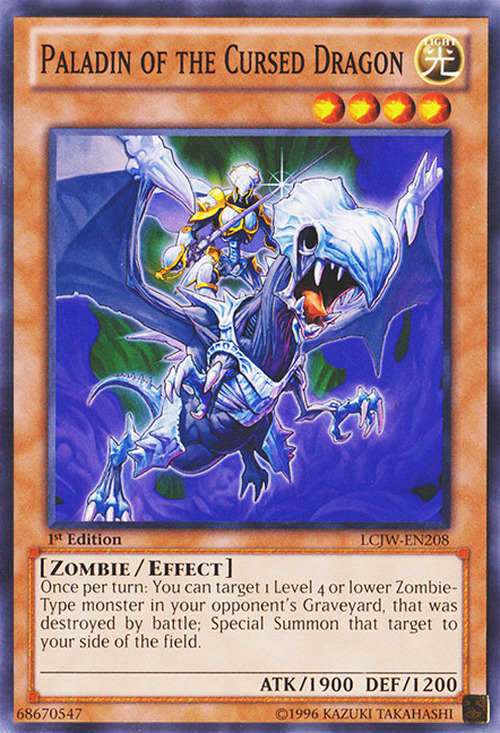 Also, among these above cards, this is the only monster whose effect doesn't involve Special Summoning Dragon-Type monsters, instead, involve Special Summoning Zombie-Type monsters. This is one of the few Zombie counterpart to have DEF points since Zombie counterparts are considered as resurrected monsters from the original. This is one of two Zombie-Types in the game to have 1900 ATK. The other is Zombie Mammoth. This card's effect targets. : Effect Monsters > "Paladin of the Cursed Dragon"
"Paladin of the Cursed Dragon" can Summon a monster affected by "Zombie World", even if the monster was not Zombie-Type when it was destroyed by battle. : When a monster which was already destroyed by battle becomes Zombie-Type, can it be targeted with "Paladin of the Cursed Dragon's" effect? If the selected monster is not a Zombie-Type monster when "Paladin of the Cursed Dragon"s effect resolves, then the effect resolves without effect. For example, if "Mystical Space Typhoon" is chained to the effect and destroys "Zombie World", then "Paladin of the Cursed Dragon"s effect resolves without effect. : When the monster targetted by "Paladin of the Cursed Dragon" is not Zombie-Type when the effect resolves, is it still Special Summoned? When a monster Summoned by "Paladin of the Cursed Dragon" is destroyed by battle, you can Special Summon it again with "Paladin of the Cursed Dragon"s effect. : When a Zombie-Type monster is destroyed by battle after being Special Summoned by "Paladin of the Cursed Dragon", can you Special Summon it?